Being in the music business isn’t only about performing. In fact, entertainment management jobs make up about 41% of music industry jobs, while independent artists make up less than 1%. Entertainment management encompasses a variety of roles—from managing artists and venues to concert organization, promotion and more. An entertainment manager is often involved in both business and legal decisions for clients, and may provide career advice—particularly for up-and-coming musicians. 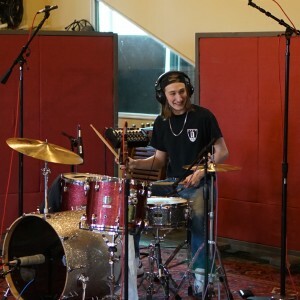 If you’re passionate about music, work well with people and can coordinate complex situations, the music industry may be the field for you, and the Entertainment Management Program at Bay State College is the place to pursue it. Bay State’s eight-semester program provides the highest-quality education in the live and recorded-music fields, centered on the development of critical thinking, business knowledge, and practical marketing skills. Given the program’s emphasis on learning to work collaboratively, developing decision-making skills, and using the latest technology in communications, it will even serve you well in a variety of other industries. You’ll take courses on business and management principles, while also gaining hands-on experience through internships and campus events. “Real-life experience is key to really understanding this field. It’s possible to make a living with something that you’re passionate about, and our program ensures students learn the critical-thinking needed to succeed,” says Entertainment Management Professor Jess White. Plus, our Career Services department can help you land internships and jobs while you’re a student in the program and after you’ve graduated. If music’s your passion, it’s time to make it your career! Explore the Entertainment Management Music Industry Concentration program at Bay State College. No performance audition required! What are the computer requirements for participation in an online program?